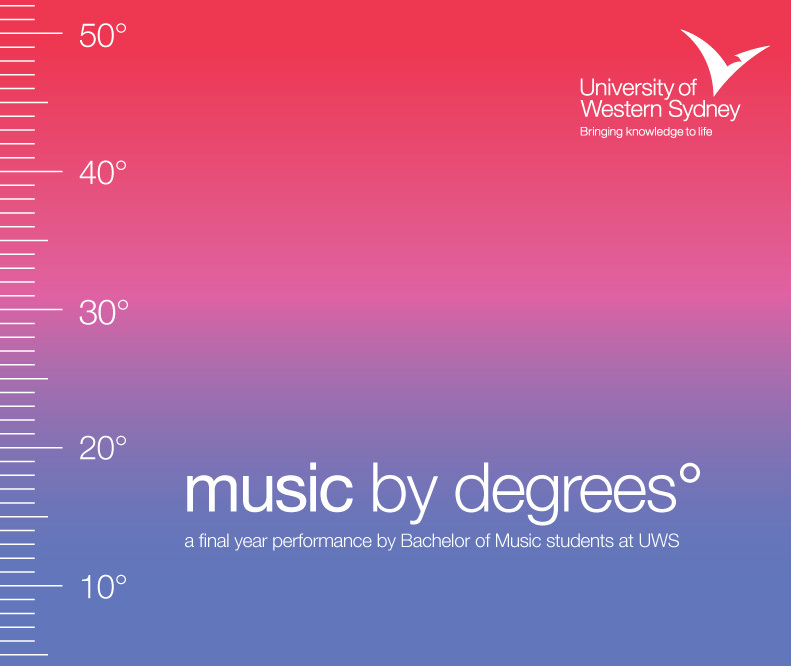 Music by Degrees is a performance project based upon aspects of the Bachelor of Music degree at UWS. Each performance subgroup reflects outcomes from core units within the degree itself, and in this respect is a showcase for what students have learned and applied to their own performance practice. The final performance will be aimed both toward prospective students as an indication of what to expect from the degree, and to fellow students, parents, and significant others as a demonstration of what we have gained from our studies at UWS, in what aims to be an entertaining and captivating performance. Subgroup 2(a) – What We Came in With – a deliberately stilted performance, giving an impression of the performance techniques (or lack thereof) one would expect of students commencing the degree. Subgroup 3 – Free Improvisation – A demonstration of free improvisation techniques learned in the units Introduction to Music Performance and Free and Notated Music Performance, working with a single note (a ‘drone’) and employing timbre, register, space and dynamics to create interest. Subgroup 6 – Soundscape – based upon the unit Sound Synthesis and the Sound Environment, utilising a mixture of extended performance techniques and manipulated audio samples to create an immersive audio environment. Subgroup 4 – Arranging Music – drawing on the Arranging Music unit of the degree, by the performance of an existing song which is ‘arranged’ in an alternate musical context. Subgroup 5 – Expanded Practice – drawing on the Sound and Performance: Expanded Practice unit, this performance incorporates elements of both theatre and multimedia, as an extension of performance practice. Subgroup 1 – Collaboration – based on the unit Collaboration and Live Music Performance, this performance is a demonstration of onstage performance skills acquired through the collaboration process, such as the use of dynamics and persona. Subgroup 2(b) – What We’ve Come Out With – a final performance which encompasses aspects of all of the previously mentioned techniques in a grand finale. Subgroup 6 draws upon the learning content in Sound Synthesis and the Sound Environment, and in the case of my own performance practice, owes much to soundscapes evident on rock albums of the 1960s and 70s, particularly those of Pink Floyd and Brian Eno. I am interested in timbre and the ‘vertical’ nature of sound, which resonates with Eno’s approach to music creation, in that “you could mess with time – storing it and then distorting it any way you wanted.” (Tamm, 41). In Imaginary Landscapes, Eno remarked: “I want to make a kind of music that had the long ‘now’ and the ‘big’ here, and for me that meant this idea of expanding the music out to the horizons” (Imaginary Landscapes, 4:19). In this sense, by employing analog delay and echo in conjunction with a ‘bowing’ technique utilising a bottleneck slide (borrowed from David Gilmour of Pink Floyd), I give an impression of stretching time, by controlling the speed of the echo repeats and making them feedback on themselves, resulting in a kinetic, textural wall of sound. Combined with manipulated audio samples generated by Ben Turner and Alex Salazar, and the extended performance techniques of Thomas Hodson and Blaise Parnell, we hope to capture the best aspects of the Sound Synthesis unit in an immersive audio experience. Tamm, Eric. Brian Eno: His Music and the Vertical Color of Sound. Da Capo Press, Boston USA, 1989.